The first flights have begun to arrive at London Heathrow’s new Terminal 2; almost 60 years after the original Terminal 2 opened as the airport’s first passenger terminal in 1955. United Airlines was the first airline to move into the terminal and will operate 17 arriving and 17 departing flights for nearly 6,000 passengers today. Terminal 2 will eventually be home to 26 airlines – 23 members of the Star Alliance as well as Aer Lingus, Germanwings and Virgin Atlantic Little Red. Airlines will move into the new terminal in phases over the next six months. When fully occupied, Terminal 2 will have 332 daily flights to 54 global destinations. 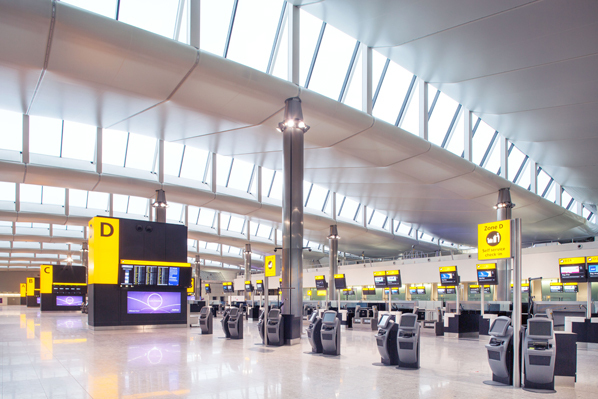 The new Terminal 2 is the next step in the transformation of passenger service at Heathrow. The proportion of passengers rating their journey at Heathrow as “very good” or “excellent” has increased from 41 per cent in 2006 to 80 per cent in 2014. Terminal 2 is a £2.5 billion project and marks the latest phase of an £11 billion private sector investment that has transformed Heathrow for passengers. This investment includes the construction of Terminal 2A and B, Terminal 5 A, B and C, a new control tower, and the refurbishment of Terminals 3 and 4. The new Terminal 2 has been named ‘The Queen’s Terminal’ in honour of Her Majesty Queen Elizabeth II. The terminal will be honoured with a Royal opening on June 23rd when Her Majesty The Queen will visit the airport accompanied by His Royal Highness The Duke of Edinburgh. John Holland-Kaye, Heathrow chief executive designate said: “Terminal 2 is the culmination of an £11bn investment programme that has transformed Heathrow for passengers. “Opening a new terminal is one of the most complex challenges that any airport can undertake. “Our measure of success is not everything running perfectly on day one – there will inevitably be things we can improve. Terminal 2 has a number of world firsts, including an airport debut for British high-street favourite John Lewis. Terminal 2 also welcomes multi-award winning chef Heston Blumenthal with the opening of his newest restaurant, The Perfectionists’ Café. In total there will be 33 retailers at the new terminal, including iconic British brands such as Cath Kidston and Ted Baker and luxury fashion houses such as Mulberry and Burberry. This will be complemented by 17 food and drink outlets including a Fuller’s pub serving London Pride and The Gorgeous Kitchen – a restaurant created by four local female chefs. The terminal is made up of 118,000 individual pieces of equipment - from light fittings to escalators. Some 24,000 staff from 160 organisations need to come together to deliver a great experience for passengers. Holland-Kaye added: “Heathrow is confident but not complacent about the opening. “We recognise that there will inevitably be some teething problems in the first few days. 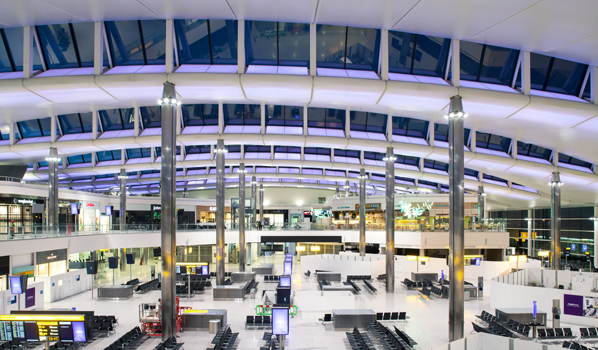 Heathrow has sought advice from other airports around the world and learnt lessons from opening Terminal 5. More than 180 trials have taken place over the last six months involving 14,000 volunteers. Some 100,000 bags have already passed through the Terminal 2 baggage system, with peak loads tested at 4,000 bags per hour compared to an expected peak of 2,500 bags. Every person working at Terminal 2 has been required to participate in familiarisation and training sessions with more than 1,700 sessions taking place. Airlines will move into the new terminal is a series of 11 airline moves over the course of six months. The terminal will operate at just ten per cent of its total flight volume on the first day. The new Terminal 2 is also an essential part of Heathrow’s plans for expanding the airport. Holland-Kaye added: “If government supports a third runway at Heathrow then Terminal 2 will be extended to become one of two main passenger hubs for the airport. “Heathrow East (an extended Terminal 2) and Heathrow West (Terminals 5 and 6) will be the main passenger terminals for a three runway Heathrow. “These terminals and their satellite buildings will be connected by one underground passenger transit and baggage system. “The aim is to make Heathrow feel like a single integrated airport, creating simpler journeys for passengers,” he concluded. Breaking Travel News editor’s blog: How long before Tory u-turn on Heathrow? Editor’s Blog: What does coalition means for tourism?